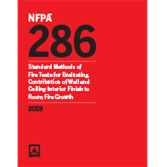 Apply the 2019 edition of NFPA 286 to thoroughly evaluate and assess the full range of wall and ceiling interior finish materials. Also known as the "room corner" test, NFPA 286, Standard Methods of Fire Tests for Evaluating Contribution of Wall and Ceiling Interior Finish to Room Fire Growth, provides a method of determining the flammability characteristics of exterior, non-load bearing wall assemblies and panels that are required to be of non-combustible construction but may contain combustible components. Vital for testing laboratories, NFPA 286 addresses all wall coverings, including textile wall coverings. Measurements in the fire test room document the extent of fire growth, rate of heat release, total heat released, time to flashover, time to flame extension, total heat flux incident to the floor, upper level gas temperature, smoke obscuration, production of carbon monoxide, and emissions of other combustion gases. Access options for substrate materials in the 2019 edition. Interested in other editions of NFPA 286? Use the drop down menu above to select the edition year you need. 4.2 Geometry and Construction of the Fire Test Room. 5.4 Acoustical Materials and Other Board Materials. 5.5 Batt- or Blanket-Type Insulating and Other Flexible Materials. 5.8 Wall or Ceiling Covering Materials. 5.9 Laminated Products with Wood Substrates. 6.1 Fire Test Room Environment. 7.1 Fire Test Room Instrumentation. 7.2 Canopy Hood and Exhaust Duct. 7.3 Instrumentation in Exhaust Duct. 8.1 Calibration and Documentation of Ignition Source and Test Equipment. 10.3 Release Rate of Combustion Gases. 11.2 Report of Significant Events. 11.3 Report of Single Point Key Properties. Apply the 2015 NFPA 286 to accurately assess the fire growth impact of all types of wall and ceiling interior finishes. Used primarily by testing laboratories, NFPA 286, Standard Methods of Fire Tests for Evaluating Contribution of Wall and Ceiling Interior Finish to Room Fire Growth provides a method of determining the flammability characteristics of exterior, non-load bearing wall assemblies and panels which are required to be of non-combustible construction but may contain combustible components. NFPA 286 addresses all wall coverings, including textile wall coverings.